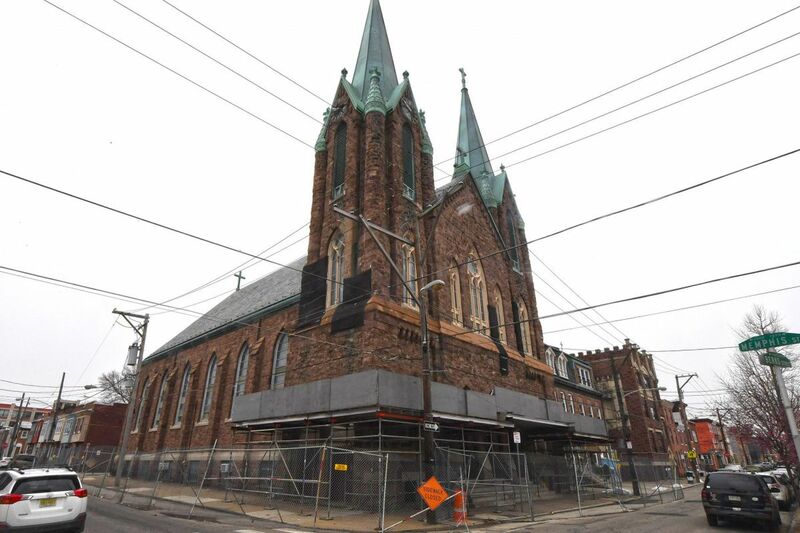 Since being listed on Philadelphia’s Historic Register, a protective fence has been erected at St. Laurentius in Fishtown, The 19th-century Polish church has languished — not for want of a developer, but because of a nuisance lawsuit. Almost three years have passed since a small miracle occurred at the Philadelphia Historical Commission. Over the strenuous objections of the Archdiocese of Philadelphia, the board agreed to place Fishtown's St. Laurentius Roman Catholic Church on the historic register. The archdiocese, which had been bent on leveling the deconsecrated building, then reversed course and found a developer willing to convert the 19th century Polish church into apartments. The decisions were hailed as a major victory for preservation in Philadelphia, but today that little brownstone church, built in 1882 with donations collected by Fishtown's struggling Polish immigrants, sits broken and forlorn at the corner of Berks and Memphis Streets. It's surrounded by a chain-link fence and trapped in web of legal challenges sponsored by an opaque group that claims to have the best interests of St. Laurentius at heart. The group goes by the name "Faithful Laurentians" and is said to comprise former parishioners and neighborhood residents. I use that awkward description because I couldn't get any active members to speak to me. Its two most visible participants, Venise Whitaker and Jeanne Curtis, say they are no longer involved with Faithful Laurentians, although Whitaker's name appears on the latest court challenge. Both the group's membership, and its motivations, have always been less than transparent. No one using the name "Faithful Laurentians" participated in the bruising, community-wide effort to get St. Laurentius historically designated in 2015. When the Faithful Laurentians surfaced a year or so later, it was to challenge the apartment conversion, which had just been approved by the Zoning Board. Its members said they were fighting to have St. Laurentius reopened as a church. Over time, however, their stated goal has shifted. Some suggested they would be satisfied to see St. Laurentius converted into offices. Others said they wanted to to see the church turned into a banquet hall. Whoever they are, the Faithful Laurentians still have a lawyer, Hal Schirmer, a veteran of numerous preservation battles. This week, he told me that he has just filed an appeal in Commonwealth Court, after being shot down in a lower court in November. The goal now, he said, is to reduce the number of planned apartments, from 23 to 12. "Putting in 23 units with no parking will overburden the location," Schirmer said. This is how the former convent for the Holy Name church at 1422 E. Susquehanna Ave. was converted into apartments. Most of the architectural features have been incorporated into the new design. So now we know what the "Faithful" care about most. The fight over St. Laurentius isn't about "saving" a historic church that resonates deeply with Philadelphia's Polish community and many Fishtown residents. The real issue is parking. Without a doubt, finding a parking space in Fishtown can be a challenge, just as it is in other popular residential neighborhoods. But the idea of prioritizing easy parking over the survival of an important neighborhood landmark is not merely misguided; it's deeply selfish. Fishtown has been undergoing rapid change as developers replace its quirky old houses and small factories with modern housing. In the face of such intense, homogenizing forces, distinctive buildings like St. Laurentius are a bulwark against the further loss of neighborhood's character and authenticity. But time is running out. St. Laurentius is not in great shape. The Polish immigrants who financed the church were not wealthy, and their architect, Edwin Forrest Durang, built the structure in inexpensive brownstone, a soft material that decays easily. One reason the archdiocese sought to demolish the building in 2014 is because its two copper-tipped bell towers were already showing signs of deterioration. Those towers are almost certainly in worse condition today, argues A.J. Thomson, the Fishtown resident who led the fight to have the building listed on the historic register. The longer the lawsuit goes on, the less likely it is that St. Laurentius will survive intact. Although the developer, Leo Voloshin, told me he is still committed to the project, he says he will eventually have to move on if the legal case isn't resolved. Then what? While Voloshin has an agreement to buy St. Laurentius, the archdiocese remains its owner until the lawsuit is resolved. So far, it has defended the apartment conversion. But if the sale falls through, the archdiocese could petition the Historical Commission for permission to demolish the church under a financial hardship clause. It wouldn't be the first time that a single-minded opposition group has derailed a preservation deal while proclaiming its desire for preservation. The former Samuel Sloan mansion at 40th and Pine might be standing today if residents hadn't fought proposals to incorporate the house into a hotel complex. Concerns about parking similarly motivated their lawsuit. In a city like Philadelphia, with so few incentives for historic rehabs, preservation efforts require compromise. What makes the Faithful Laurentians' lawsuit seem especially frivolous is that nearly every group involved with the church has supported Voloshin's apartment conversion. That includes the Preservation Alliance and Oscar Beisert, the preservation advocate who nominated the church for historic designation, as well as members of the city's Polish community. The former convent for the Holy Name church at 1422 E. Susquehanna Ave. in Fishtown has been converted into eight apartments. Parking has a way of clouding otherwise reasonable minds. Fishtown is lucky that two religious buildings on East Susquehanna Avenue were recently given new life. But the conversion of the former Holy Name convent was almost derailed when a Fishtown group insisted that the developer, Bob Huttenlock, reduce the number of apartments from nine to eight. Because, parking. What the parking-obsessed fail to realize is that Fishtown is thriving precisely because it has not allowed the automobile to dominate. It's still walkable and has excellent transit connections, especially the Market-Frankford El. The newcomers who will occupy the Holy Name convent, the former Fifth Reformed Dutch Church, or St. Laurentius are likely to be car-free millennials. Schirmer says he is not troubled by the risk the latest lawsuit poses to St. Laurentius. Should the old Polish church be torn down, he noted that a developer would be able to build only six townhouses. The parking fanatics would love that. But what a tragic loss the outcome would be for Fishtown, the city and its Polish heritage. Somehow, it seems, the only thing the Faithful Laurentians are faithful to these days is their own self-interest.